Houzz 77 of our visitors have told a friend about this plan. This charming European plan features brick, stone and shake siding exterior with arched doors and windows and a 3-car garage. Upon entering the foyer, the Great Room with its vaulted ceiling is open to the kitchen and breakfast room which features an eat-at bar. The Master Suite has a 10' boxed ceiling and a huge walk-in closet. Bedrooms 2, 3, and 4 are located on the other side of the house with 2 full baths. There's also a bonus room located over the garage. Question: Do you have a similar plan with a different roof style? 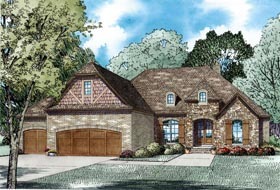 Answer: We have these plans with less space same roof style. Question: can this plan be done with a walkout basement?? If you want the designer to create a finished basement layout, please request in detail what changes you want to plan and designer will quote your changes.